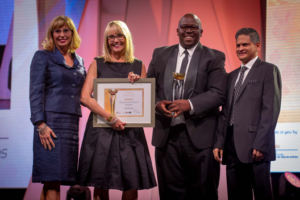 Solar Capital won the prestigious ‘Investor of the Year’ category at the South African Premier Business Awards on Tuesday 6 December. The annual gala event organized by the Department of Trade and Industry, Proudly South African and Brand South Africa was held at the Sandton Convention Center in Johannesburg with a keynote speech made by the Minister of Trade and Industry, Dr Rob Davies. To date, Solar Capital has invested over R5 billion (Euro 350m) in solar farms in South Africa. The major portion of the investment was in the Solar Capital 175MW solar facility located outside of De Aar in the Nothern Cape. This is now in full production and is supplying green electricity to over 75,000 homes daily. The facility was constructed as part of the very successful Renewable Energy Indepdendent Power Producer Procurement (REIPPP) Programme and is the culmination of a two-phase project, making it the largest solar farm in Africa, the Middle East and the Southern Hemisphere. The Solar Capital projects, under the REIPPP Programme, are contracted to sell electricity, to the value of R25 billion (Euro 1.7 billion), to the South African power utility Eskom over the next 20 years. In 2017 Solar Capital will continue its expansion across the Northern Cape when it begins construction of a new 86 MW solar PV farm in Loeriesfontein, with an investment of R1.8 billion (Euro 125m). The Phelan Energy Group, through its subsidiary Solar Capital, has plans for further investment of over R21 billion (Euro 1.5 billion) in South Africa solar industry. “It is an incredible worldwide growth story. A recent extensive Bloomberg study forecast that $11.4 trillion will be invested worldwide in electricity generation by 2040. Of that a remarkable $7.8 trillion, or 68%, will be invested in renewable energy. To date China has grabbed the bulk of that opportunity, but it is not too late for South Africa, who has the key attributes for similar success, to sieze a significant share” added Phelan. Left to right: Johannesburg Stock Exchange Capital Markets Director Donna Nember, Solar Capital Economic Development Director Janice Finlay, Solar Capital Community Liaison Manager Thabiso Mosai, Head of Invest SA at the Department of Trade and Industry Yunus Hoosen. Photograph provided by Proudly South African.